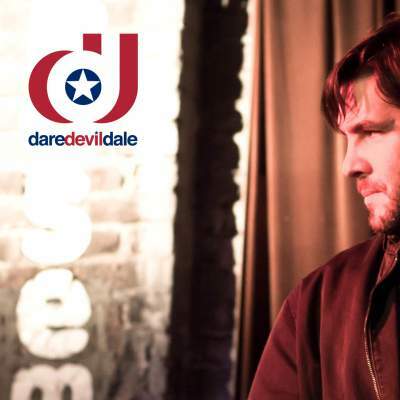 Explosively expatriated from the farmlands of Ohio, singer-songwriter Doli Stepniewski breathes mischievous spirit into creative alter-ego, DareDevilDale. Known for effusive hooks and anthemic power-pop melodies, he creates vivid tales of love and catastrophe… fit for the pages of a graphic novel. Each song pulls equally from Stepniewski’s own experiences as both an accomplished touring musician (Owsley, Amy Grant, Under The Big Top) and a successful tech entrepreneur. The result is an accessible yet divergent sound delivered with a wink and nod to musical superheroes Stewart Copeland, Gordon Sumner, Andy Summers, Stuart Adamson and John Taylor. When not criss-crossing the boundaries of the American soundscape as DareDevilDale, Stepniewski is an animator and rock & roll developer in Nashville, Tennessee where he lives with his wife and three sons.